About 700 people (including OPI employees and their children) were present yesterday as George Schaeffer, surrounded by new Dell desktops, announced the company’s computer and scholarship winners. 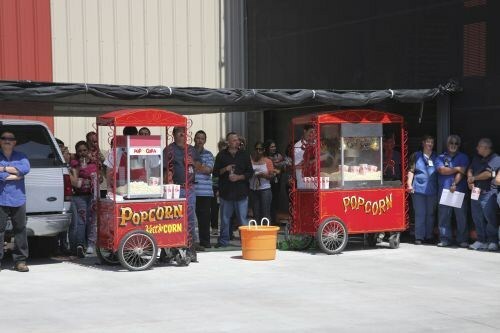 OPI created a festive atmosphere for the occasion, with popcorn, pretzel, and lemonade carts on site. George Schaeffer and Los Angeles city controller Wendy Greuel unveil the dedication plaque as the company celebrates a new traffic light at Saticoy and Ethel streets. Yesterday was a momentous day at OPI’s headquarters in North Hollywood, Calif., as the company gave back to its employee’s children, its employees, and its Southern California neighborhood. The company celebrated its fifth computer and scholarship giveaway event, in which it awarded 101 new Dell computer systems and 18 scholarships to children of OPI employees, plus had a special ceremony to dedicate a new traffic light.